Provides high density and low power consumption. The XH310 V3 is a new-generation half-width, single-socket server node for X6000 high-density server. The XH310 V3 uses Intel®Xeon®E3-1200 v3 Refresh series processors and supports one 3.5-inch SATA HDD and four Double Data Rate 3 (DDR3) DIMMs. It is an optimal choice for web access servers that have high requirements for data reliability. 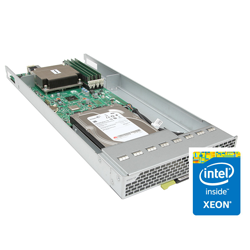 Huawei server node with Intel® Xeon® processor. Web access applications require a small amount of computing and storage resources on a single server. Even a 1U rack server with low-end configuration used for web access may cause wastage of cabinet space and server resources. The XH310 V3 is designed for web applications with optimized resource configuration, maximizing Return On Investment (ROI). The XH310 V3 uses one Intel® Xeon® E3-1200 v3 Refresh series processor and supports one 3.5-inch SATA HDD and four DDR3 DIMMs. It consumes less power than a conventional 2-socket rack server with one processor. An X6000 (2U) can hold four XH310 V3 server nodes, offering servers four times more dense than a conventional rack server. The XH310 V3 can be easily installed and maintained through simple insertion and removal, reducing the service roll-out time. Management Onboard BMC supports IPMI, SOL, KVM Over IP, and virtual media and provides one 10 or 100 Mbit/s RJ45 management network port.